A beer garden is an open-air area around a traditional inn (Gasthaus) or a brewery. 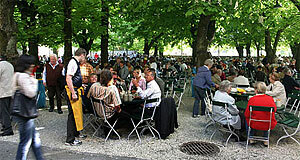 Beer gardens are very common in Austria, especially in the Western parts of the country. Salzburg is culturally heavily influenced by Bavaria and part of the Central European beer belt. Therefore, you can expect a large number of beer gardens in both city and state of Salzburg. On the countryside, almost every decent traditional inn has a beer garden, typically comprising of various tables with chair or benches, a surface base of pebbles (typically white limestone) and covered by chestnut trees. The chestnut trees are particularly important and provide shade - the second-most important ingredient for a beer garden after the beer. In this article, we will point you at the most attractive beer gardens in Salzburg - in our personal opinion. Warning: Some beer gardens (or actually: many) in the city centre tend to be overpriced and lack authenticity because they target only tourists as a customers. The following beer gardens are those we can recommend based on personal experience. A lot of experience, to be honest. Let′s start with the very best: The biggest beer garden of Austria and one of the biggest in Europe is also famous beyond Austria for its excellent beer. The Müllner Bräu or Augustinerbräustübl is a meeting place for students, old locals and tourists from around the world. The beer is cheap and there are market stalls where you can get overpriced food; alas, it is allowed to bring food and eat it in the beer garden or indoor halls. Situated in the old Augustinian monastery, which is known only a brewery. A very traditional inn right next to the Müllner Bräu has been refurbished a couple of year ago. It comes with a beautiful beer garden and high-quality food. Tends to be less crowded than the big brother next doors. Krimpelstätter sells the same beer as the Müllner Bräu, but at higher prices; alas, you will also find a cosier atmosphere and good, traditional food. A refreshing and modern interpretation of the beer garden theme can be found in the Weißbierbrauerei, colloquially known as "Die Weiße" ("the white one"). It is located in a residential area at the end of Linzergasse (bring a map if you go there). Famous for both the stylish interiors and the excellent Weißbier (white beer), brewed on site. The brewery of Kaltenhausen is situated on the outskirts of Hallein and not in Salzburg itself. We have only included it on this list because we think that the Bernstein (amber) beer of Kaltenhausen deserves being mentioned. Stop by Kaltenhausen if you happen to travel by car and if you want to combine beer with a trip to the salt mine of Hallein (also highly recommendable). As we said in the introduction to this article, every respectable inn in Austria will come with a beer garden; if you happen to be in areas with few tourists, the risks are low and chances high. Just enter and enjoy - Prost!